'The one who gives Tzedakah, makes a thankful offering:"
Ahavat Torah has three Tzedakah programs. Use any of the following ways to honor, commemorate, and recognize life's most important events with a unique message of care and compassion. · reason for donation: e.g., birthday, get well, thank you, sympathy, births, etc. · payment information: check or credit card information. 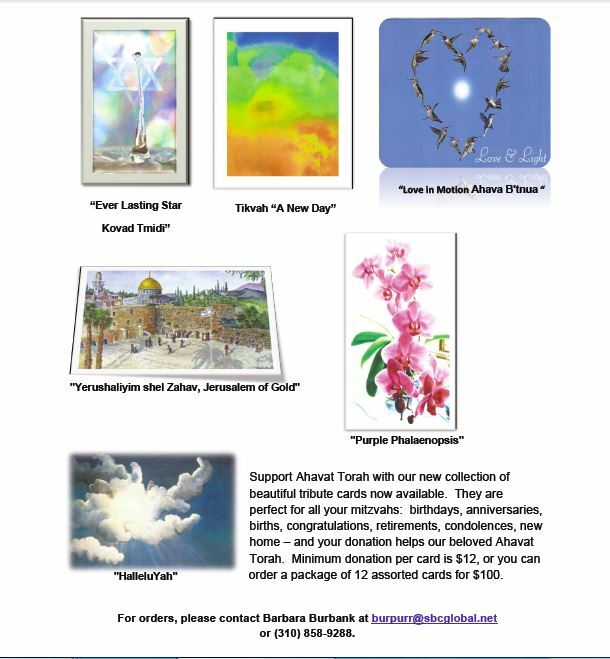 Support Ahavat Torah with our new collection of beautiful tribute cards, now available. They are perfect for all your mitzvahs: birthdays, anniversaries, births, congratulations, retirements, condolences, new home – and your donation helps our beloved Ahavat Torah. - or you may save $20 by prepaying $100 for a package of 12 assorted cards of your selection. STEP 3. Send your check or credit card information to Ahavat Torah, PO Box 442, Santa Monica, CA, 90406. Throughout our years, Ahavat Torah has been fortunate in having a few anonymous members who graciously donated over and above their dues. By providing extra funds, they play an instrumental part so our congregants are able to attend events such as our retreats and fundraisers, help us to meet our budget, and so much more. Your donations may be anonymous, but we would love to acknowledge you. Donations will be acknowledged in the Ahavat Torah Newsletter. For further information, please contact Shoshi at motek2222@gmail.com.